Japanese automaker Infiniti has made some tough decisions this week, including one to completely leave the Western European market. The decision was made due to slow sales, as Nissan's luxury arm could never make a name for itself as Toyota's Lexus division has. Infiniti says it will now focus on its largest markets in North America and China as well as smaller but growing markets in Eastern Europe, the Middle East, and Asia. Along with an exit from the European market, Infiniti will be killing of its smallest crossover, the QX30. An Infiniti spokesperson told CarBuzz that the "QX30 has incurred disappointing sales results globally, and we concluded that there is no longer a viable business case for it to be offered in our lineup." We really liked the QX30 when we drove a Sport model back in 2017, so we are sad to see it go. The QX30, despite its Infiniti badge, was actually a Mercedes GLA 250 underneath. Everything including the engine, transmission, and electronics were all shared directly with the Mercedes. The potential of an AMG-powered model was always enticing but Infiniti never followed through. With Infiniti set to exit the European market, the Nissan Sunderland plant in the UK will no longer build the QX30 for global consumption. 2019 will officially be the QX30's last year in a production run following just three model years on sale. If you'd still like to buy a QX30, likely at a discount, there should still be plenty of 2019 models sitting at US dealerships until supplies run out. Even though the luxury sub-compact crossover market is booming, Infiniti was never able to sell enough QX30s to meet its sales goals. Only 2,259 examples were sold during a partial sales year in 2016, followed by the strongest sales year of 14,093 units in 2017. By 2018, Infiniti could only move 8,101 examples of the QX30 while Mercedes moved over 24,000 examples of the GLA. 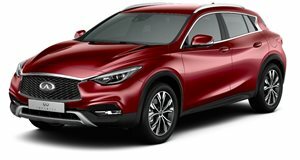 Even the decision to change the car from its initially planned hatchback bodystyle and 'Q30' name was not enough to help the QX30 sell well in the US. We haven't heard much in the way of a successor but we wouldn't be surprised if the company's next sub-compact SUV is built in house.